The Brussels Griffon is a breed of toy dog named after their city of origin: Brussels, Belgium. This breed is known by some as "the velcro dog" because they love to stick by your side. You won’t be making many solo trips to the kitchen or bathroom with one of these pups around. Griffons do demand attention, but if managed correctly, will easily become your closest companion. They adapt well to condo or apartment living, have a ton of energy but are easy to train. The Brussels Griffon is considered to be generally healthy, but poor breeding practices have led to some breed specific health problems. It’s always important to consider this when adopting or purchasing a dog. Take a look at some charming examples of this breed that we love so much! 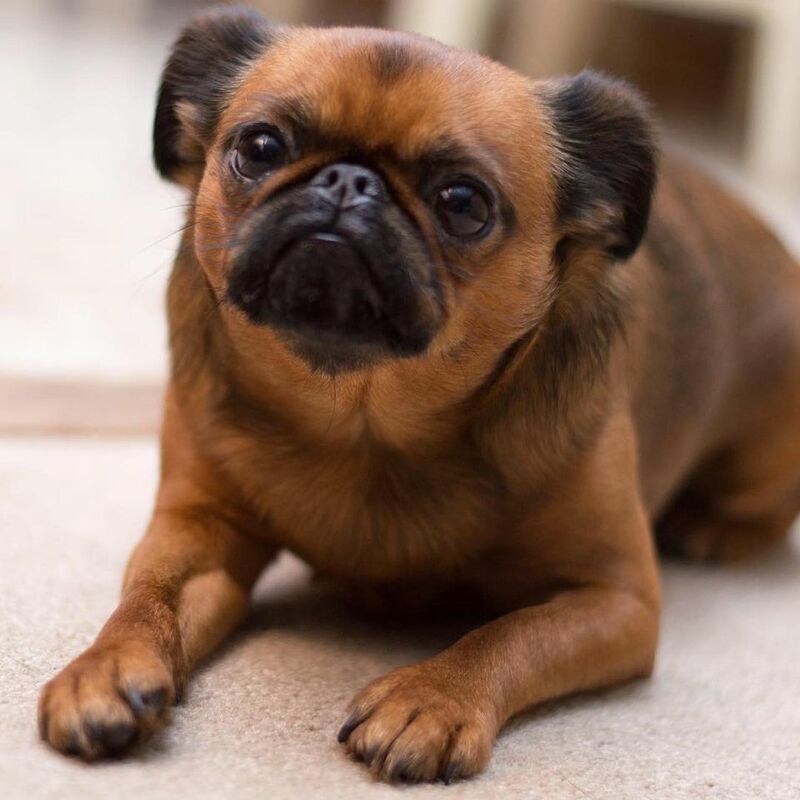 In Europe, Brussels Griffons are separated into three different breeds according to their coats: Petit Brabancons make up the smooth-coated variety, Brussels Griffons possess red/fawn rough coats, and Griffons Belge have rough coats of any color other than red or fawn. In America, they are all considered one breed: the Brussels Griffon. Leto, pictured here, would be considered a Petit Brabancon. Donnie Barko is a shorthair Brussels Griffon living in the UK. He looks super adorable dressed in a sweater, but we especially love his stylish orange beard. Kevin is a handsome Griffon with a longer, rougher coat. This impressive facial hair would classify him as the Griffon Belge variation of the breed. This type of Griffon is known for it's wiry, tousled hair. Digby and Alo are two Griffons living in New Zealand. As you can see with these two, the longer the hair, the bigger the beard (and in some cases, the mustache, too). This next little Griffon is so cool, he even acts as the CEO for his own company. Chamacorp sells everything from doggie sweaters to slings for carrying your furry friends with you on your travels. Bart is another Petit Brabancon. You can tell by his smooth, short coat, which we're sure is a plus in his hometown of sunny Los Angeles. Griffons are sometimes likened to Ewoks, the little creatures from the Star Wars universe, due to their human-like facial features. It’s not hard to see why. Wicket is actually a Brussels Griffon/terrier mix–no Ewok in this guy's lineage! Britney and Miley are two great examples of how different the variations in this breed can look. While the temperaments may be similar, the facial hair sure isn't. In case you were wondering, these fabulous ladies' full names are Miss Britney Houston and Petit Miley Left Eye Lopez. Sprout is just a little Griffon trying to make it in the Big Apple. You can buy an adorable​ 2018 calendar featuring handsome shots of Sprout doing everything from modeling sweaters to exploring NYC. Even better, all proceeds go to rescue groups! We think this is the real squad goals. The dog parent of this motley crew describes her Brussel Griffons as "5 tiny humans trapped inside Griffon fur bodies." This Griffon looks more like a car salesman than a tiny dog, but you won't see us complaining. According to this Griffons owner, when you think Brussels Griffon, think “catfish monkey dog.” This pooch embodies all three of these creatures effortlessly. These dogs are smart, loyal, energetic and make great companions. No matter what variation of Griffon you like best, there is no question that they are all adorable, unique dogs!